My Envy Box of December 2016: Lashes and Pouts! I am always excited about lip products. In spite of having a zillion lip products in my stash, I still never feel they are way more. In fact, one or few more to that stash wouldn't hurt. ( I am now speaking like a true addict!). 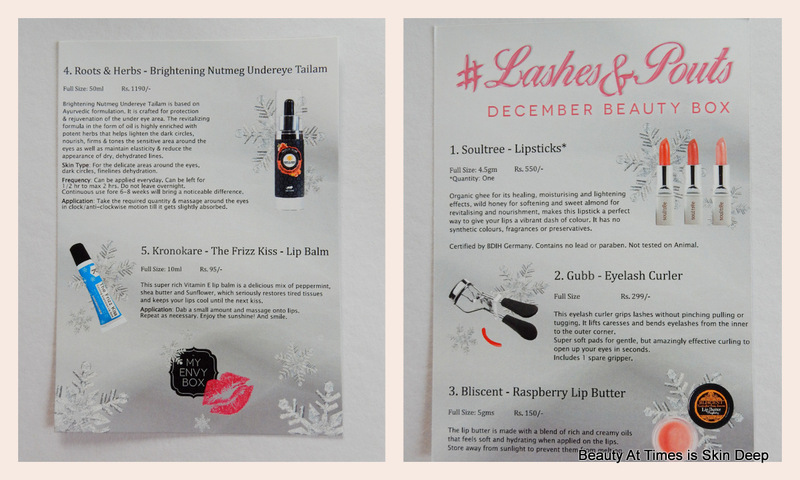 So, the 'Lashes and Pouts' theme of My Envy Box of December did excite me a lot! What came inside the box did make me very happy! This time, everything is full size and what can I ask for more? Roots and Herbs Under Eye Tailam ( Full size in the box. Rs 1190 for 50 ml): Even though I have oily skin, my under eyes are extremely dry. Sometimes, I rub on olive oil and wipe it off before putting on makeup so that it doesn't look flakey. So, this tailam/oil seems to be ideal for me. Bliscent Lip Butter( Full size. Rs 150): Don't we need this? It's winter and who likes chapped lips? Kronokare The Frizz Kiss Lip Balm ( Full size Rs 95): I love this kind of old school lip balms! I would get back to you with the efficacy of this one. Gubb Eye Lash Curler (Rs 299): I am not a big fan of eye lash curlers, especially since, because of my dry eyes, my lashes tend of fall off and I don't want to damage . Soultree Lipstick( Rs 550): This one is such a nice break from all the other brands. I mean, in India, the number of brands are limited and I feel they all feel very similar. At least this one smells different. What I like about My Envy Box of December 2016 is the fact that it contains mostly lip products and the under eye product seems just right for me. The products are all full sized and the overall value of the box is way more than what I paid for. But I have only one complaint. I have always maintained that My Envy Box never makes false claims of demands. Even though they did not claim about the number of products included, every photo of their adverts showed 3 lipsticks in stead of only 1 included in the box which might be misleading. Do I recommend? I do! Get this before the subscription closes.